Ads on the Windows 10 taskbar aren't just for Microsoft Edge anymore. 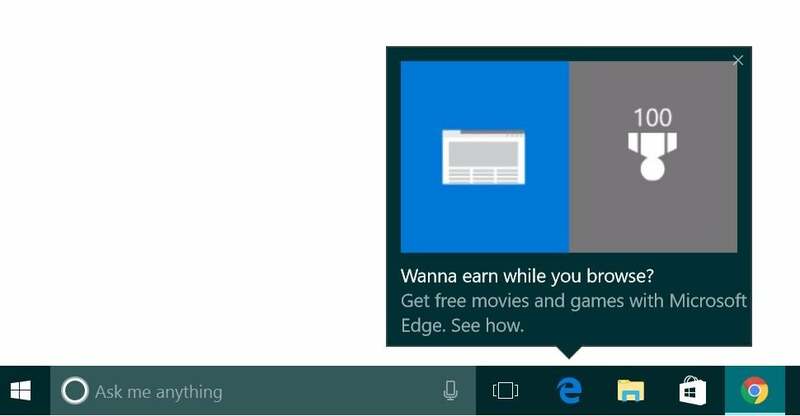 Microsoft’s aggressive advertising push inside Windows 10 is going beyond pop-ups for Microsoft Edge. Myce recently spotted yet another pop-up ad on the taskbar in Windows 10. This time around Microsoft was advertising its extension for Chrome dubbed the Personal Shopping Assistant (Beta). The extension is a Microsoft Garage project that lets you compare prices across shopping sites. Prior to the Chrome extension pop-up, Microsoft was advertising its rewards program for Microsoft Edge, which we spotted in early November. The earlier ad appeared to be targeted at people who didn’t use Edge that frequently. A pop-up ad that promotes Windows 10's Edge browser and Bing Rewards. The pop-up for the Chrome extension looks similar, as you can see on Myce. The Chrome one, by comparison, is probably targeted at people who use Chrome as their default browser. Microsoft's likely thinking that if people won’t stop using Chrome on Windows, at least they can use some Microsoft software while they’re doing it. Tests or not, it’s unlikely that Microsoft will ever stop these taskbar ads even though users pay $100 or more for Windows. Thus far, Microsoft has advertised its own software and services. The impact on you at home: If you want to make sure you don’t get pop-up ads on your taskbar you can turn them off. Open the Settings app and go to System > Notifications & Actions. On this screen under “Notifications” turn off Get tips, stricks, and suggestions as you use Windows. That’s not the only way Microsoft can advertise to you. Check out our earlier look at how to stop 7 ways that Windows 10 pushes ads at you.